Kevin Garnett’s business on an NBA court has been to hate a lot of people. He’s a prick. He’s a schoolyard bully. At least that’s what I figure all the cussing is for, but sometimes he’s just cursing at the air, or the wind, or the sky being blue. Garnett is a mythological, defensive creature. Trust me, I’ve seen it all, up close and personal, and I’ve got the photos to prove it. Nas’ raps should be locked in a cell, it ain’t hard to tell: Garnett absolutely despised the way Blatche used to (and sometimes still does) loaf around the court, showing no heart. 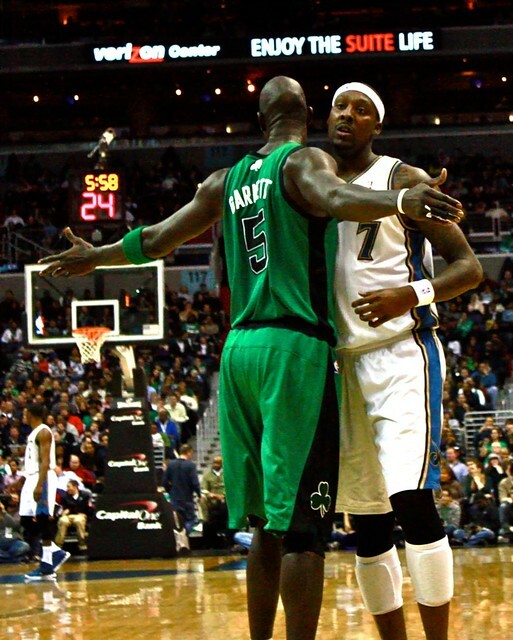 Once asked about Andray Blatche, Kevin Garnett simply furrowed his brow, pointed several times to his own chest. Translation: No heart. Now, per the dismantling of the Boston Celtics leading Garnett—along with Paul Pierce and Jason Terry—to be traded to Brooklyn, along with reports that Blatche has decided to re-sign with the Nets, the two have been united as NBA mates. Blatche’s contract is reportedly worth $1.4 million over one year. Taking into account the “offset amount” for amnestied players, the Wizards will be still be paying Blatche around $7.5 this season. Had he signed with another team for more money, as reports had the Clippers and Warriors showing interest in Blatche, the cost to the Wizards could have been less. Worth noting that both Blatche and Garnett share an agent, Andy Miller, which sounds fun. In light of all this, let’s take a quick peek at history. 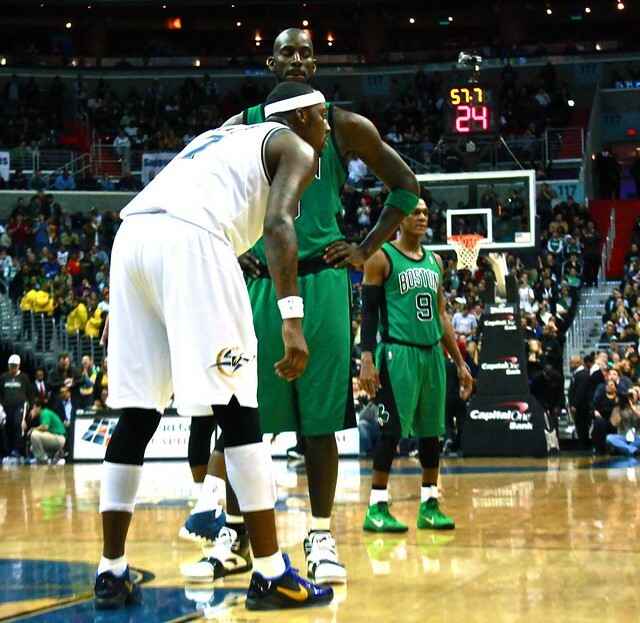 In early March 2010, the Wizards’ jalopy rolled into Boston for a Sunday showdown, carrying 21-38 record in the midst of the disastrous locker room guns campaign. The Wiz Kids, who had won seven of their previous 15 games, played with (over)confidence and surprised Boston with a 25-19 first quarter lead and then held a four-point lead after three quarters. And a 23-year-old Blatche was taking it to a 34-year-old Garnett, even going so far as to call him “washed up” at one point, per report from the Washington Post’s Michael Lee. But Boston stormed back with a 24-17 fourth quarter and took the game by three points, 86-83. Garnett entered the game for Glen “Big Baby” Davis with 7:37 in the final period and the Celtics down 11 points, 75-64. The rest is history. “We choked. Six minutes to go, we’re up 13. We got young guys, they don’t know what it’s like to be in the situation. We start talking to Garnett, start talking trash and everything else. Got Garnett and those guys’ juice up and we just pissed down our leg the last six minutes. “You have a veteran team that knows how to close out games against a young team that hasn’t been there. Instead of letting a sleeping dog lie, we just juiced up their energy. We had players coming out of timeouts, we had guys going to the wrong side of the floor. We were so discombobulated. Blatche brushed off the criticism, and advice, from his coach. But if you watch the post-game video, seen on this old TAI post via Comcast SportsNet, Blatche seemed like a puppy to Garnett’s wolf—you can almost see him get lost in the emotion, the almost tears. “You know I’m a man just like they a man. If a man is talking to me this close to my face, I’m going to say something back. I’m a man just like he’s a man. You have to respect when I respect him. About a month later, the Wiz Kids again went into Boston, but this time took the game. They won by 10 points, 106-96, despite the Celtics’ best efforts to steal the game—the C’s outscored the Wizards 42-31 in the fourth quarter. A seemingly more mature Blatche put up 31 and 11 on the night. Blatche’s career has been up-and-down since. Well, mostly down. It wasn’t the only heated moment between the two. As you can gather by the pictures in this post, Garnett frequently tried to antagonize Blatche into running away with his tail between his legs. In total, per Basketball-Reference.com, Blatche and Garnett have faced-off 22 times over their career with Garnett winning 13 times and Blatche winning nine—perhaps not the discrepancy one might expect; with the Nets, Andray is 4-4 versus Kevin, 5-9 as a Wizard (four contests coming when Garnett was with Minnesota). Now, at least, Blatche will continue to search for his way on a team with championship aspirations, however grandiose those may be. And he’ll be paired with a guy who will #*%$#* his #$@$-ing ! @)#@% every time that little muther*$%@)# dicks around in #@$%(%$& practice. You’re not taking the Blatche out of Blatche and you’re not taking the bully out of Garnett. They were made for each other, or reality TV, and it’s finally going to happen. And Ted Leonsis and the Wizards are technically paying for the mentorship, at least 84 percent of it. So… three cheers for Andray, three cheers for Kevin, three cheers for the NBA’s odd couple joining forces in Brooklyn… we think.